Furious maenad. 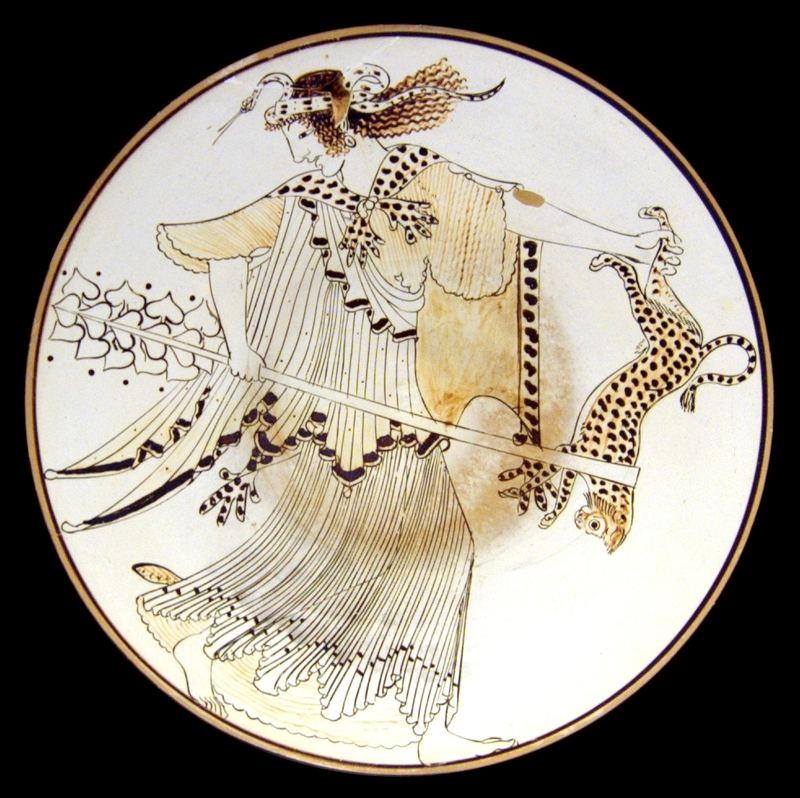 A spectacular Attic white-kylix 490-480 BC from Vulci. Google for "Christ and Dionysus" and you see how much interest there is today in the relation between Jesus of Nazareth and the fascinating ancient Greek god Dionysus (Roman Bacchus). Great deal of the modern interest seems to come from comparisons suggesting direct connection between the two. It is notable how many Atheists and Christian apologists argue in public about the issue of Greek mythology and Christ. Here I am looking only at the particular issue of the suggested presence of the cult of Dionysus in Palestine at the time of Jesus. Peter Wick published in the Pontifical Biblical Institute's journal Biblical a scholarly paper «Jesus gegen Dionysos? Ein Beitrag zur Kontextualisierung des Johannesevangeliums», Vol. 85 (2004) 179-198. Abstract: The author of the article intends to show, that not just the episode of the "miracle at Cana" (John 2,1-11), but the gospel of John as a whole disputes in an implicit way the worship of Dionysos, which was wide-spread in Syria and Palestine. Jesus is presented as the true son of god, who surpasses the god Dionysos in every way. John represents the old Jewish tradition of disputing the worship of Dionysos. This dispute implies the rejection as well as the surpassing adoption of Dionysian elements. The author of the gospel strengthens the identity of his communities, which are confronted by the Hellenistic world, by arguing as a scripture-rooted Jew within the symbolic world of the Hellenistic mainstream. Plutarch (46-120 AD) is the principal witness among non-Jewish classical authors for the suggestion that wide-spread worship of Dionysus existed among the Jews. After the festival called 'the fast' [the Day of Atonement], during the vintage, the Jews place tables laden with different fruits in booths of thickets woven from vines and ivy. Their first festival is called by them Sukkah (σκηνή). A few days later, the Jews celebrate another festival, which one may simply call a Bacchanalian festival. For this is a festival on which the Jews carry fig branches and sticks adorned with ivy and carry them into the Temple. One does not know" – adds Plutarch – "what they do in the Temple. It seems reasonable to suppose that they practice rites in honor of Bacchus. For they blow small horns as the people of Argos do during the festival of Dionysus, and call upon their god. Others, who are called Levites, walk in front, either in allusion to Lysios (λύσιος) – perhaps 'the god who attenuatescurses' – or because they call out 'Euius,' i.e., Bacchus. According to Plutarch the subject of the connection between the Dionysian and Jewish cults was raised during a symposium held at Aidepsos in Euboea, with a certain Moiragenes linking the Jewish Sabbath with the cult of Bacchus, because "even now many people call the Bacchi 'Sabboi' and call out that word when they perform the orgies of Bacchus." Tacitus too thought that Jews served the god Liber, i.e., Bacchus-Dionysus, but "whereas the festival of Liber is joyful, the Jewish festival of Liber is sordid and absurd." Pliny, Natural History 5:18, 74. An inscription found at Beth-Shean dating from the time of Marcus Aurelius mentions that Dionysus was honored there as ktistes. Stephen of Byzantium reports a legend that connects the founding of the city of Rafa also with Dionysus (for the Dionysian foundation legends of cities in the region, see A. Lichtenberger, "City Foundation Legends in the Decapolis," in: Bulletin of the Anglo-Israel Archaeological Society 22 (2004), 23–34). IMHO the highly respected historian Plutarch totally misses here the point and apparently does not really know Judaism at all as his description of the Feast of Tabernacles is a total misinterpretation of it. Of the quoted witnesses the terse statement by the venerable historian Tacitus has apparently heard of Plutarch's description but he dryly remarks how different the worship of Liber (Dionysus) and the sordid Jewish feast are. Indeed, the two have nothing in common and are in the opposite ends of religious cult practices. The evidence concerning cities of Decapolis is interesting and apparently correct. One has to remember, thought, that Decapolis was inhabited by pagans and the cities avoided by religious Jews. Skythians may well have revered Dionysus in Beth Shean and Byzantine inhabitants of Rafa were quite possibly not Jews majority of whom were at this time living in the Diaspora. To conclude, the cult of Dionysus may have existed in Palestine as so many other cults did, including Tammuz, Sun and Jupiter (all related to Dionysus). Existing textual and archaeological evidence does not seem to suggest such a wide spread religious cult that Peter Wick assumes in his interesting article on the spiritual context of the Gospel of John. Saving the weddings at Cana and being the god of wine does not necessarily establish a live connection between orthodox Jewish Jesus of Nazareth and the pagan god Dionysus worshiped by the gojim.